Season the salmon fillets and place in a foil parcel on a baking tray leaving the top slightly open. In a blender or food processor, gently use the pulse setting to mix together the olive oil, lemon zest and juice, mint and capers, and drizzle over the salmon. Close the top of the foil parcel and place in the oven for 15-20 minutes. Boil the potatoes in a pan for 10 minutes, adding in the asparagus for the final 5 minutes. Drain the potatoes and vegetables. 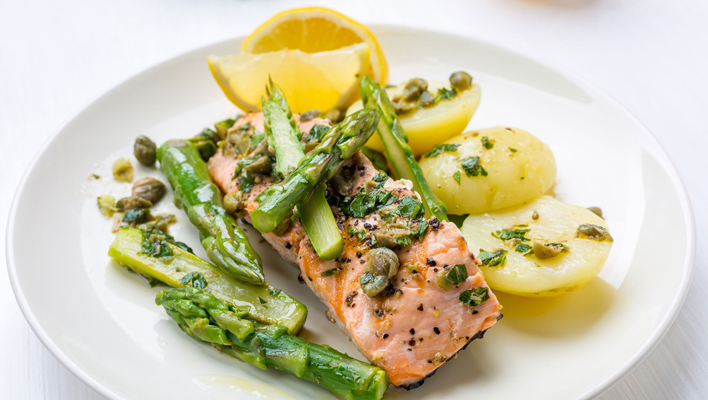 Serve the potatoes and salmon, topped with the asparagus spears and drizzled with lemon juice. 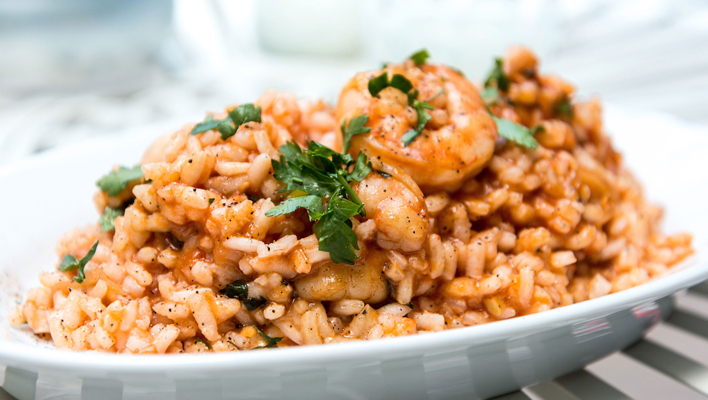 Lightly spray a large casserole dish or frying pan with Frylight and set over a medium heat. Add the lamb meat to the pot, and cook until evenly brown. Season with the allspice, cinnamon, cloves, nutmeg and cardamom. 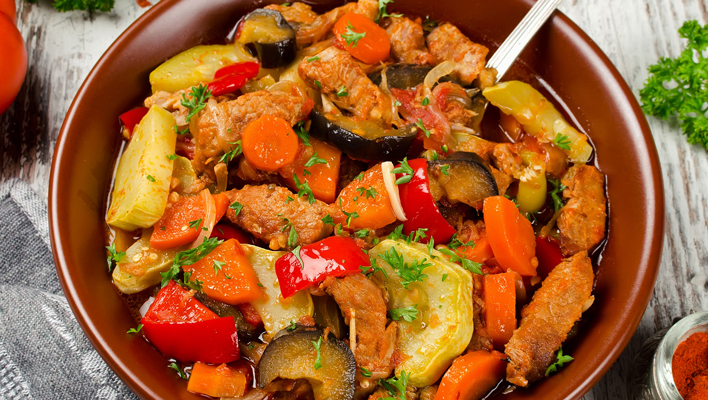 Layer all of the vegetables over the over the lamb – but do not stir. Place the chilli pepper in the centre of the vegetables and season with salt. Mix the tomato puree and water together, and pour over the vegetables. Bring to the boil and reduce the heat to low. Simmer for 1 hour until the vegetables are tender. With a pestle and mortar, crush together the garlic a pinch of salt and the mint. Mix with 2 tablespoons of liquid from the pan and pour over the ingredients. Spoon the mixture into warm bowls, trying to keep the layers intact. Enjoy! Lightly spray a frying pan with Frylight and set over a medium heat. Cook the onion, garlic and leek for 5-6 minutes until starting to soften. Add the rice and stir well to coat then pour over the stock and simmer for 15-20 minutes. Add the fish and prawns and simmer for a further 10 minutes stirring regularly, until the fish is cooked through and flaked, and most stock is absorbed. Season generously with black pepper and serve garnished with fresh parsley. Melt the butter in a pan over a high heat and add the roughly chopped asparagus. Add in the peas, mint and stock, and bring to the boil. Reduce the heat and simmer for 5-6 minutes then removed from the heat and leave to cool slightly – a further 5 minutes. 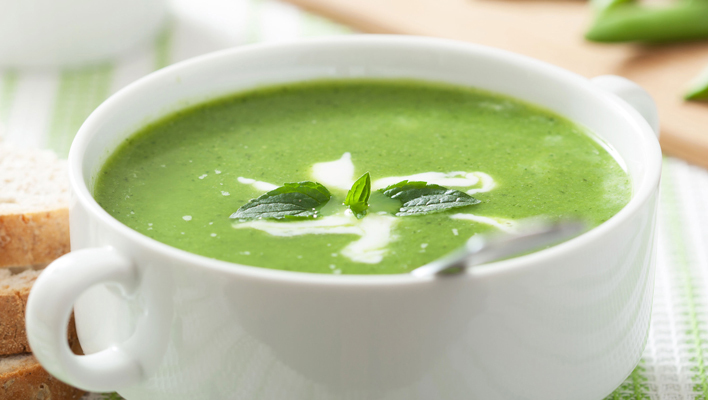 Mix well using a hand blender or food processor, and serve topped with sour cream and a few sprigs of fresh mint. 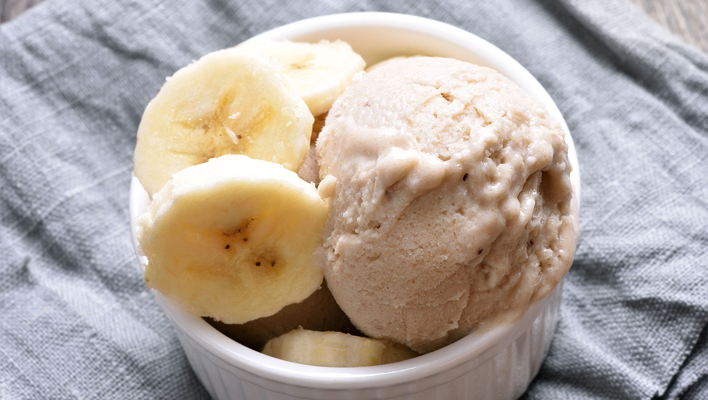 Put the fromage frais and frozen banana in a blender, blitz for 10-15 seconds until well combined. Spoon into a tub and place in the freezer for 2-3 hours. Peel and slice the bananas and mix together with the toffee yogurt – leaving 8 slices for a garnish. Spoon the crushed digestives into the base of 4 small pots, and top each with the toffee yogurt and banana mix. Whisk the cream until it forms stiff peaks, then gently fold in the Greek yogurt. 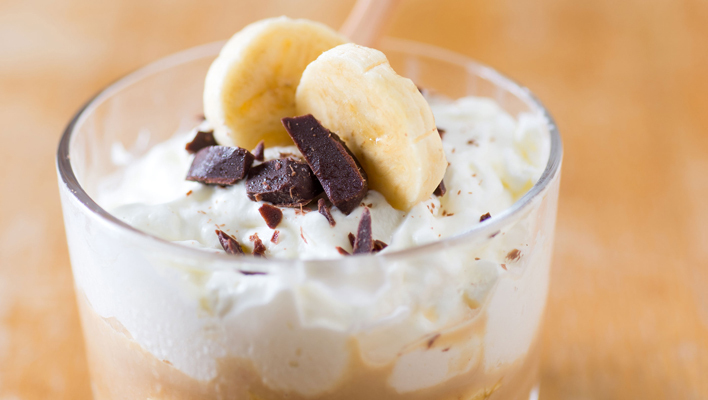 Place the cream mix on top of the toffee yogurt and banana mix, top with some dark chocolate and 2 slices of banana. Enjoy!